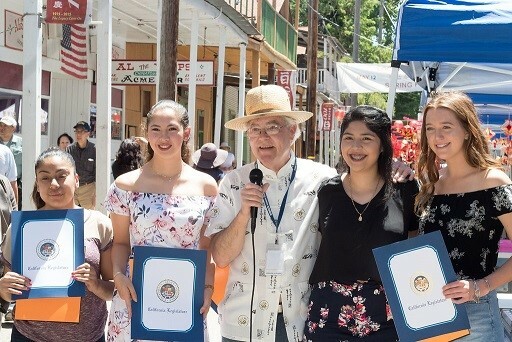 Four local high school seniors were honored at a presentation ceremony staged during the Locke Asian Pacific Spring Festival. In addition to receiving a Locke Foundation Scholastic Achievement certificate each student received a check for $500. These four outstanding students were also acknowledged with academic achievement certificates from the office of State Assemblyman Jim Frazier. Scholarship recipients were chosen on the basis of grade point average, extracurricular activities, public service and quality of written essays penned on the theme: How would I preserve and promote the town of Locke? The qualifications of the 2018 LF scholarship applicants was extremely high, making the selection process difficult. The four students chosen for Locke Foundation Academic Awards excelled in each category of achievement. Recipients of the 2018 Locke Foundation Scholastic Achievement Awards are: Tillie McTeer – Rio Vista High School. Tillie will be attending San Diego State University and majoring in Recreation and Event Planning. Felicity Cordova – Delta High School. Felicity shall attend California State University-Sacramento and will pursue a career in Special Education. Lucero Macias-Torres – Delta High School. Lucero will be studying at Cosumnes River College and majoring in Agricultural Business. Cynthia Osorio – Delta High School. Cynthia will also be attending California State University-Sacramento where she will major in Social Work. The Locke Foundation is extremely proud to honor these four rising stars. Each path is bright …. and each future filled with promise.